Swanton’s Jayde Kruzel pitches versus Archbold on Thursday. Rigo Ramos of Archbold takes a swing during a NWOAL matchup with Swanton Thursday. The Blue Streaks improved to 2-0 in league play after an 11-3 win over the Bulldogs. Coming through when the chances came was the name of the game Thursday as Archbold scored eight of its 11 runs with two out in a 11-3 win at Memorial Park over Swanton in Northwest Ohio Athletic League baseball action. The difference came in three innings where Archbold could produce. In the bottom of the third, T.J. Rice drew a walk, then advanced to second on a wild pitch after the first two outs of the inning had been recorded. Kade Kern followed with a single to drive in Rice. After a second walk, Cory Erbskorn stepped to the plate and delivered the big hit, a two-run single. Holden Galvan smacked a two-out two-run single in the fifth that put Archbold ahead 6-2. The Steaks put the game out of reach with five runs – all scored with two outs – in the bottom of the sixth. Mitch Grosjean drew a bases-loaded walk, then scored on an error. Erbskorn again had the big hit, coming through with his second two-run single before scoring the final run in the game. 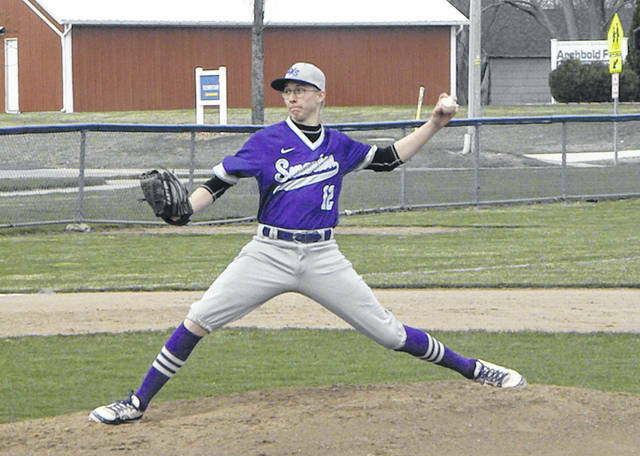 Swanton had some chances, but settled for single runs. Archbold took a 1-0 lead in the first thanks to an error, but the Bulldogs were looking to strike in the top of the third. Hunter Mix worked his way around the bases after a lead-off walk and scored on a sac fly by Michael Lawniczak. The Bulldogs had a big chance in the top of the fifth. Mix doubled and scored, but Swanton was looking for more. Before the double, Tommy Chonko was out at the plate on a failed squeeze play. At the time, the run had cut the Archbold lead to 4-2. Derek Floyd singled and scored for Swanton in the sixth, an inning where the Bulldogs left a runner – one of eight stranded on the night – at third. Aiden Warncke pitched into the sixth inning to get the win for Archbold. He allowed three runs – two earned – on four hits with four walks and five strikeouts. Erbskorn drove in four to lead the Archbold attack. Rice added a pair of singles. Jayde Kruzel took the loss for the Bulldogs. He allowed six runs – four earned – on six hits in five innings with four walks and four strikeouts. Mix had a double and scored twice for Swanton. Both teams picked up wins on Saturday. The Streaks blanked Perrysburg 11-0 at Fifth Third Field in Toledo while Swanton rallied for a 7-5 win over Rossford. Archbold (9-1, 2-0 NWOAL) plays at Evergreen Monday in league action and heads to Bowling Green Tuesday. Swanton (9-2, 0-2) hosts Bryan Monday and visits Patrick Henry Thursday in NWOAL affairs. https://www.fcnews.org/wp-content/uploads/sites/45/2019/04/web1_Kruzel-v.-Archbold.jpgSwanton’s Jayde Kruzel pitches versus Archbold on Thursday. 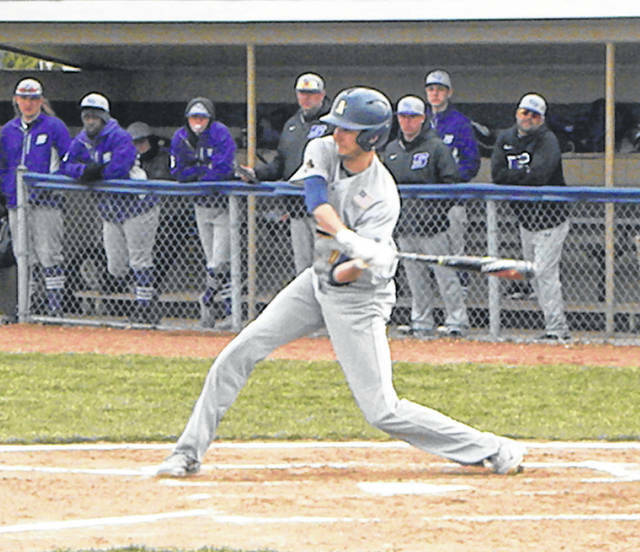 https://www.fcnews.org/wp-content/uploads/sites/45/2019/04/web1_Rigo-batting.jpgRigo Ramos of Archbold takes a swing during a NWOAL matchup with Swanton Thursday. The Blue Streaks improved to 2-0 in league play after an 11-3 win over the Bulldogs.